This civil rights movement timeline chronicles the fight for racial equality in its early days, the 1950s. That decade saw the first major victories for civil rights in the Supreme Court as well as the development of nonviolent protests and the transformation of Dr. Martin Luther King Jr. into the movement's preeminent leader. The U.S. Supreme Court strikes down segregation of African Americans in graduate and law schools. The initial case was fought by Thurgood Marshall and the NAACP Legal Defense Fund. Marshall used this win to begin building a strategy to fight the “separate but equal” doctrine established with in 1896. Linda Brown, an 8-year-old girl in Topeka, Kan., lives within walking distance of a whites-only elementary school. Because of segregation, she has to travel by bus to a more distant school for African American children. Her father sues the school board of Topeka, and the U.S. Supreme Court agrees to hear the case. The Highlander Folk School in Monteagle, Tenn., which runs workshops on organizing protests for individuals such as union organizers, issues invitations to civil rights workers. The Supreme Court decides Brown v. Board of Education on May 17, arguing that "separate but equal" schools are inherently unequal. The decision legally prohibits school segregation, declaring it unconstitutional. Rosa Parks attends a workshop for civil rights organizers at the Highlander Folk School in July. On Aug. 28, Emmett Till, a 14-year-old African American boy from Chicago, is killed near Money, Miss., for allegedly whistling at a white woman. In November, the Federal Interstate Commerce Commission forbids segregation on interstate buses and trains. 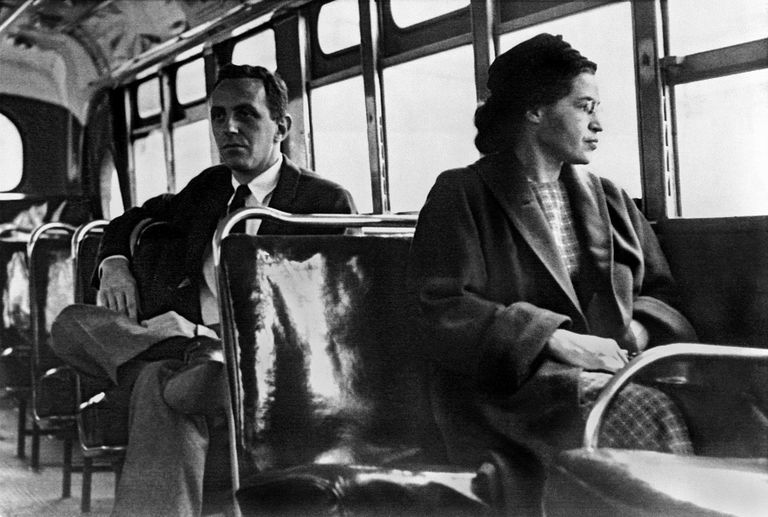 On Dec. 1, Rosa Parks refuses to give her seat to a white passenger on a bus in Montgomery, Ala., sparking the Montgomery Bus Boycott. On Dec. 5, the Montgomery Improvement Association is established by a group of local Baptist ministers. The organization elects the Rev. Martin Luther King Jr., pastor of Dexter Avenue Baptist Church, president. In this role, King would lead the boycott. In January and February, whites angry about the Montgomery Bus Boycott bomb four African American churches and the homes of civil rights leaders King, Ralph Abernathy, and E.D. Nixon. On court order, the University of Alabama admits its first African American student, Autherine Lucy, but finds legal ways to prevent her attendance. On Nov. 13, the Supreme Court upholds an Alabama district court ruling in favor of the Montgomery bus boycotters. The Montgomery Bus Boycott ends in December, having successfully integrated Montgomery's buses. King, along with Ralph Abernathy and other Baptist ministers, helps found the Southern Christian Leadership Conference (SCLC) in January. The organization serves to fight for civil rights, and King is elected its first president. The governor of Arkansas, Orval Faubus, obstructs the integration of Little Rock High School, using the National Guard to block the entry of nine students. President Eisenhower orders federal troops to integrate the school. Congress passes the Civil Rights Act of 1957, which creates the Civil Rights Commission and authorizes the Justice Department to investigate cases of African Americans being denied voting rights in the South. The Supreme Court decision Cooper v. Aaron rules that a threat of mob violence is not reason enough to delay school desegregation. Martin Luther King and his wife, Coretta Scott King, visit India, the homeland of Mahatma Gandhi, who won independence for India through nonviolent tactics. King discusses the philosophy of nonviolence with Gandhi's followers.